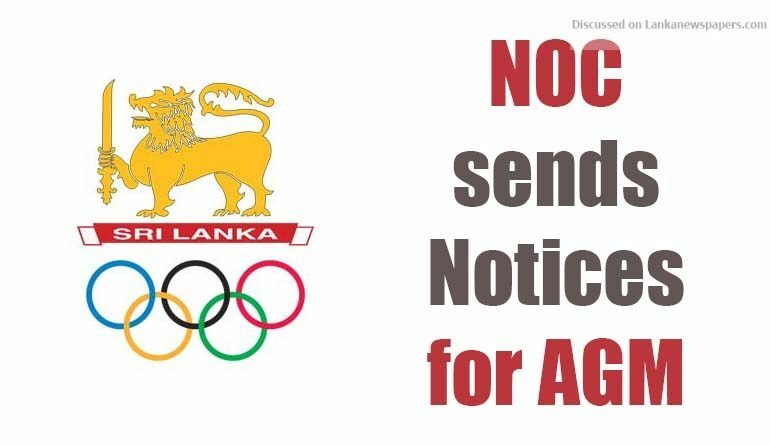 The National Olympic Committee (NOC) sent the official notification to the member clubs confirming the four-year delayed AGM will be held on 23 February. According to the constitution, Membership has to be informed 30 days ahead of the AGM. As per the notice signed by NOC President Hemasiri Fernando, Nominations will close at 4.00pm on 09 February, 14 days prior to the election. Member clubs have also been told to inform the NOC before 5 February as to who will be allowed to vote at the forthcoming AGM. “Election Commission requires you to submit the full name and the NIC number of the Voting Member to the Secretary General, NOCSL to reach on or before 1200 hrs on 5 February 2018. Any changes effected to the existing nominations have to be ratified by the Executive Committee of your National Sports Association and signed by (both) the President and Secretary of the Association (or Act. President/Act. Secretary as per the IF guidelines). Any changes received after the said deadline would be rejected and the existing nominations are treated as valid members,” said de Silva in the letter “Final Members List” along with email of the AGM notification. As Ceylon Today learns AGM’s of some National Sports Associations (i.e. Hockey) is set to be held after 5 February (before 23rd) and elected members of that NSA may not be able to Vote during the NOC election due to February 05 deadline to finalize Voting list.